If you’re considering using 3D printing as an alternative to injection moulding, our comparison tool will be able to help you make the right choice. With our tool, you are able to input your file dimensions to get a 3D print price estimate, as well as your injection mould tooling and unit costs. This will allow you to see what the price differences would be between the two manufacturing methods for different quantities. Watch our video for a quick introduction on how to use our batch production graph and discover how Additive Manufacture can save you £1000’s of pounds on production of your parts. It looks like this part is too large or needed in too high a quantity to be viable for SLS 3D printing. Please see our short guide on making parts cheaper or refresh the estimator and start again. Can I make my part cheaper? ¹ Price shown is our Economy turnaround (7-12 working days), unit cost rounded to 2 decimal places. A small enclosure to hold a PCB and camera set up. It’s thin profile makes it ideal for additive production due to its small XYZ profile. Injection moulding only becomes cheaper when ordering over 4150 units, meaning for the 500 required by the customer, printing with us was the obvious choice. A custom flange for an angled fluid delivery system used in indoor irrigation systems. Due to the complex nature of the part, the tooling cost is relatively high, meaning manufacturing this additively is viable up to about 1,900 units. This end cap is an aesthetic solution for a breather pipe. This part falls below the minimum part cost, so has a dramatic price drop with quantity. Purchasing a single item would be £1 + vat, but this drops right down to £0.46 when ordering 1,000 or more units. Moulding Unit Cost - How is this calculated? Nesting – We charge for the XYZ dimensions of the STL file you upload. You can nest multiple parts into the STL file – by doing this efficiently you can save a lot of money on your parts – please see our website for more details. Combining Parts – Many injection moulded components are made up from multiple parts, either for mouldablilty or to incorporate off the shelf items. With our processes, you can print highly complex parts in one piece, saving on the cost or multiple moulds, fasteners, assembly and design time. Reducing Size – If the size is not critical, scale the part down – it saves money very quickly. Making a part 25% smaller halves the cost, and a half scale model is a whopping one eight of the price of a full scale model. Order In Quantity – We offer generous price breaks for ordering in higher quantities – ordering in higher numbers can give you a 30% discount and smaller parts in higher volumes can be as much as 80% cheaper. SLS Could Save - How is this calculated? Nesting parts – Our pricing structure allows you to nest multiple parts in the same STL file. If you can reduce the overall XYZ dimensions of the parts you can save money. Combining multiple parts – Complex injection moulded parts may need to be made up of a number of different items due to the constraints in the moulding process – this can mean multiple different tooling costs to make the one part. 3D printing them as one part can save on multiple tooling and assembly costs. Order what you need – there is no need to order excess stock – parts can be printed to order meaning no need for large inventories or storage of these items. Design changes on the fly – if there is a problem with the design, there is no need to re-tool, simply change the design and print from there – this saves not only the cost of re-tooling, but also the time. 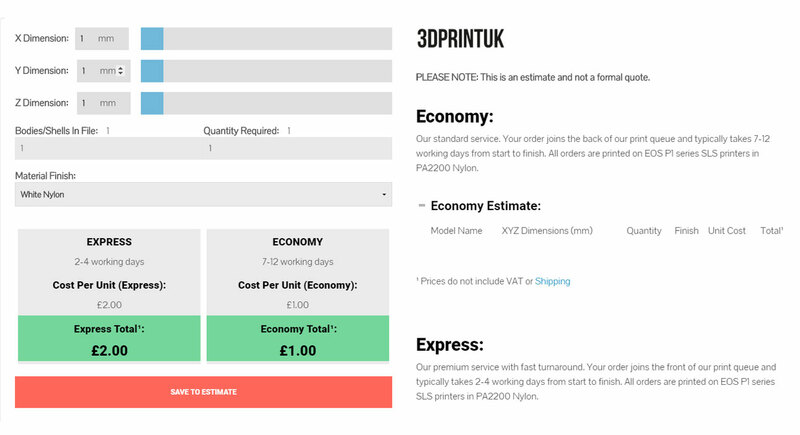 Our XYZ price estimator will allow you to work out the cost of your 3D prints through us before you have the CAD data to print from. This will help with budgeting for your project from the start. By simply inputting the X, Y and Z dimensions, you are able to get a guide price for your object. We have a handy app for price estimation – it’s free and easy to use. 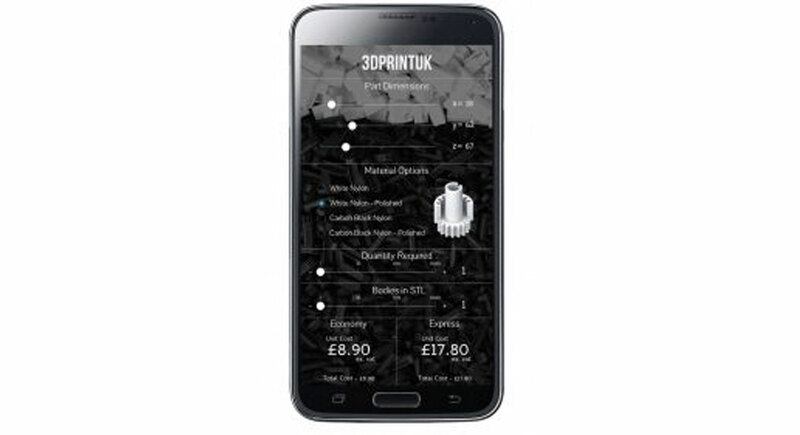 It can calculate the price of your 3D print without the requirement for an STL file. This means you can find out how much your parts will cost before you even start your CAD.